Resources — Planetary Health Now! Protecting the Health and Well-Being of Communities in a Changing Climate. Proceeding of a Conference in Brief. National Academies of Medicine. (2017) Download PDF available, guest download requires free registration. Role of Public Health Nurse in Disaster. Association of Public Health Nurses. (2013) Download PDF available. Alliance of Nurses for Healthy Environments (ANHE) has a series of continuing education videos and a full e-textbook, Environmental Health for Nursing. Also includes toolkit for communication, advocacy, sustainable practices, and disaster preparedness. BMJ Best Practice Guide to Mental health response to disasters and other critical incidents, a 14-page downloadable PDF. Bridge Collaborative, list of cross-sector resources to "unlock opportunity and impact across the health, development, and environment sectors." 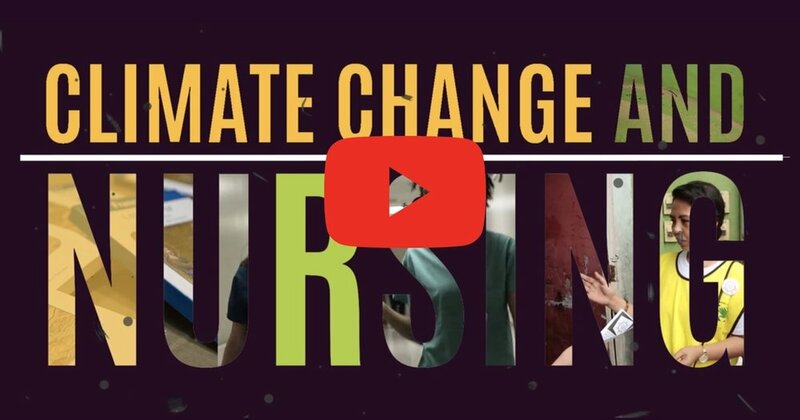 Climate Change and Nursing, a comprehensive video series, with an excellent compilation of downloadable reports and guides. Environmental Performance Initiative, hosted at Yale University, a dynamic resource tracking 180 countries on 24 performance indicators across environmental health and ecosystem vitality, intended to help policymakers' decision making and highlight sustainability best practices. FEMA, the Federal Emergency Management Agency, runs the Emergency Management Institute (EMI) offering a range of classes for emergency management and disaster response. Enrollment is generally limited to U.S. citizens. FEMA also hosts a collection of downloadable higher education articles and papers and maintains a list of colleges with emergency management courses, certificates, or degree programs. Also hosts the Incident Command System (ICS) Resource Center with checklists, training courses, forms, and reference documents. Healthcare without Harm offers an array of resources, including the Healthcare Climate Challenge, the hospital Climate Action Playbook (collection of case studies), Safe Haven in the Storm (business case for investments in healthcare resilience), and Climate Smart Healthcare (produced with the World Bank). Hospital Incident Command System (HICS) hosts a Center for HICS Education and Training that includes a downloadable PDF guidebook. National Security Implications of Climate-Related Risks and a Changing Climate, the Department of Defense Congressional Report in 2015 that outlines how various United States command centers are making plans to mitigate risks from expected changes. Nurses Climate Challenge, a HCWH project with the goal of educating 5,000 health professionals on climate and health, includes networking tool. Requires membership to access guides for talking points, talking tips, and sample emails for engaging leaders. Okanagan Charter: An International Charter for Health Promoting Universities & Colleges (2015), a downloadable PDF with the call to action to "embed health into all aspects of campus culture, across the administration, operations and academic mandates." Panorama, an advocacy and planetary health partnership building organization. Panorama hosts a series of downloadable reports: Planetary Health 101, the Planetary Health Landscape, and Global Policy Opportunities for Planetary Health. Physician's Guide to Climate Change, Health and Equity, from the Center for Climate Change and Equity. 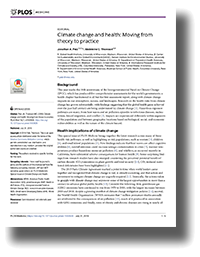 Includes a downloadable guide that "explores the complex and multifaceted connections between climate change and health, disproportionate burdens and the impacts on health equity, and opportunities for solutions." The Planetary Health Alliance is a consortium of 70 academic, NGO, research institutes, government agencies, and other partners. PHA developed and hosts a a series of Health Impacts downloadable kits (Infectious diseases, Non-communicable diseases, Physical health, Mental health, Nutrition, and Civil strife and displacement) with syllabi, learning objectives, and links to content and articles. Risky Business, a project that produces (U.S.-based) free, downloadable PDF reports to quantify the economic risks posed by climate change. Co-chairs of Risky Business include Michael Bloomberg, Henry Paulson, and Tom Steyer. Rockefeller Foundation's Planetary Health site, includes documents, infographics, and updates. On the same site, the 2015 seminal planetary health paper "Safeguarding Human Health in the Anthropocene Epoch" is available for free download. Sustainable Development Solutions Network 2017 Index Report: Achieving a Sustainable Urban America downloadable PDF. Adaptation Clearinghouse, an online database and networking site that serves policymakers and others who work to help communities adapt to climate change. American Society of Adaptation Professionals (ASAP), supports and connects professionals to better prepare for climate change. Climate Adaptation Knowledge Exchange (CAKE). A curated online source of climate adaptation case studies, resources, and tools for sharing. Georgetown Climate Center, state-level tracking of climate adaptation plans. The Consortium of Universities for Global Health is a Washington, DC-based organization of nearly 175 academic institutions engaged in addressing global health challenges. Greenhealth Magazine, the online magazine of Practice Greenhealth.